Stop what you’re doing. Just stop. Open up this link (http://bit.ly/1DSG2Lo) and use the Amazon one-click. You’ll thank me later. City of Stairs takes place in a world where a slave and servant class uprising that turns into a war that literally destroys the Gods. Generations later, the city of Bulikov, once the meeting place of the gods, is in shambles and inter-generational, systemic poverty actively enforced by the ruling government has made the area rife with conflict. What’s worse, the former ruling class (now the impoverished and oppressed) are denied any knowledge of their history and acknowledgement of their gods is illegal. A cultural ambassador meant to bridge the differences between the cultures is violently murdered. Shara Thavani, an operative of the Ministry of Foreign Affairs, is sent in to investigate the murder, only to uncover that the gods are not as dead as the world believes. Bennett’s novel has a great sense of timing. Though the plot is not very action driven, the action existing in it is well timed and impactful. Shara and her “Northman” bodyguard named Sigrud have some fantastic battles against the gods and the gods’ pets. The real shining star of the novel, though, is the character building. Bennett’s characters are fully-fleshed and are very different from one another. Even the supporting characters are well written and feel like real people. Bennett’s female characters are awesome. One of my biggest issues with women in SFF is the way authors often sacrifice emotion or depth of emotional response in female characters in exchange for clever or physically capable characters. Bennett’s story was full of women who had varied roles, positions, and personalities. Each one is emotionally developed and intriguing. They’re also all capable. Shara is a great example, but my favorite character in this regard (as much as I loved Shara) was the Bulikov governor. The governor, who is also a military officer, is determined and capable, but also is given a great depth of character with independent motivations. Just an outstanding job. Easily a favorite for the year. 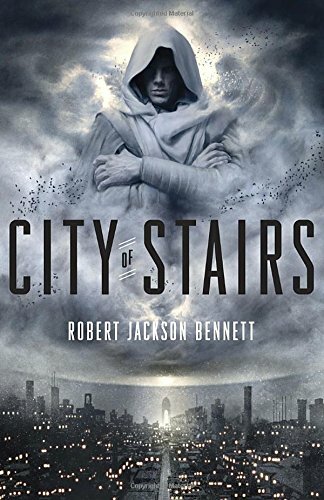 I received a copy of City of Stairs by Robert Jackson Bennett for free in exchange for an honest review from BloggingforBooks.com. And boy am I glad I did. This entry was posted in Reviews and tagged Book Review, Books, City of Stairs, Robert Jackson Bennett, Science Fiction, SFF, Shara Thavani, Sigrud, The Kaj.